As the year comes to a close, I thought I would take this opportunity to recount some of the amazing things the GCI has accomplished over the last year. I should preface this list by saying that there are many things the GCI has been up to this year that don’t appear on the list – for example our ongoing trivia activities and the green chemistry seminar series, which are some of our greatest achievements overall – but here I wanted to highlight some of my favorite activities and initiatives that were new for us. 1) In February 2014, we launched the 12 principles of green chemistry video campaign, posting our inaugural video about principle #1 on preventing waste. To date, we have produced and published videos outlining the first 4 principles and plan to finish up the remaining 8 in the near future. Be sure to check out all our videos so far on our YouTube channel! 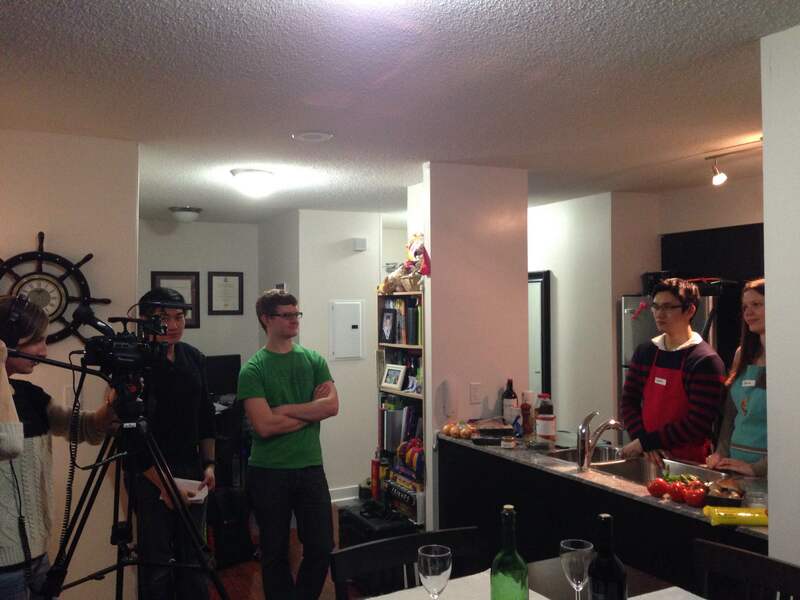 Behind the scenes at our first video shoot. 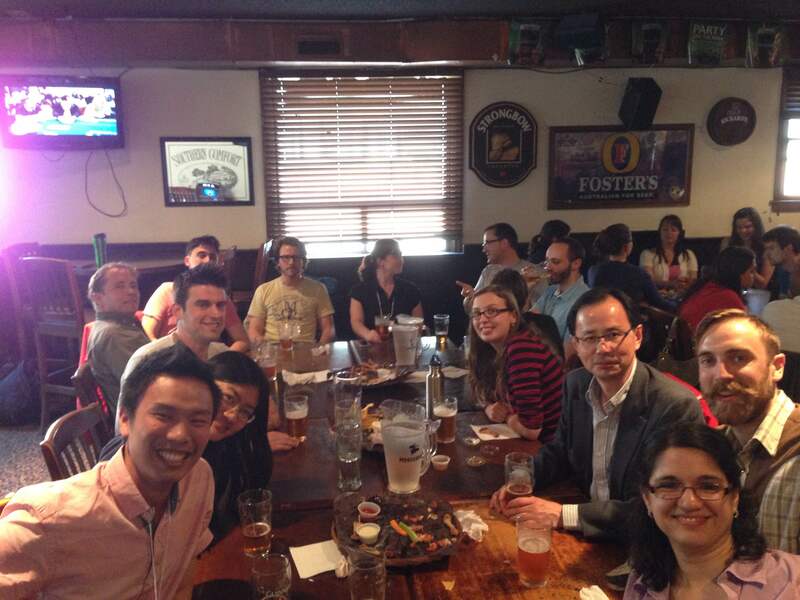 2) On May 21-23, 2014 we hosted our second annual workshop, “The Next Steps in Green Chemistry Research”, at the University of Toronto. The workshop was a huge success with 12 invited speakers and over 70 participants attending from across North America. Workshop attendees and speakers mingle at the social event. 3) In January 2014, we launched a Waste Awareness Campaign and started tracking the chemical waste produced in Lash Miller. We shared the result of the collected data with the department in September, and then hosted a lecture about waste collection and disposal given by Ken Greaves and Rob Provost. 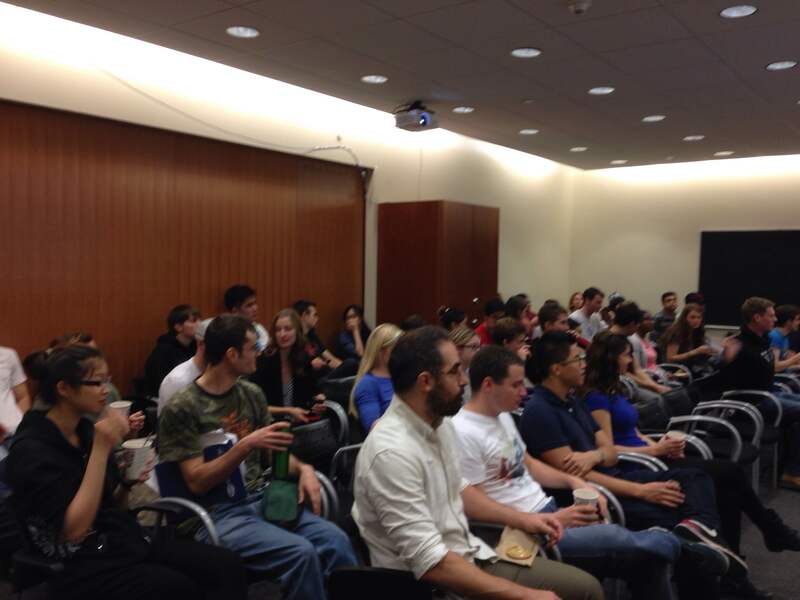 Great turnout for the waste disposal talk! 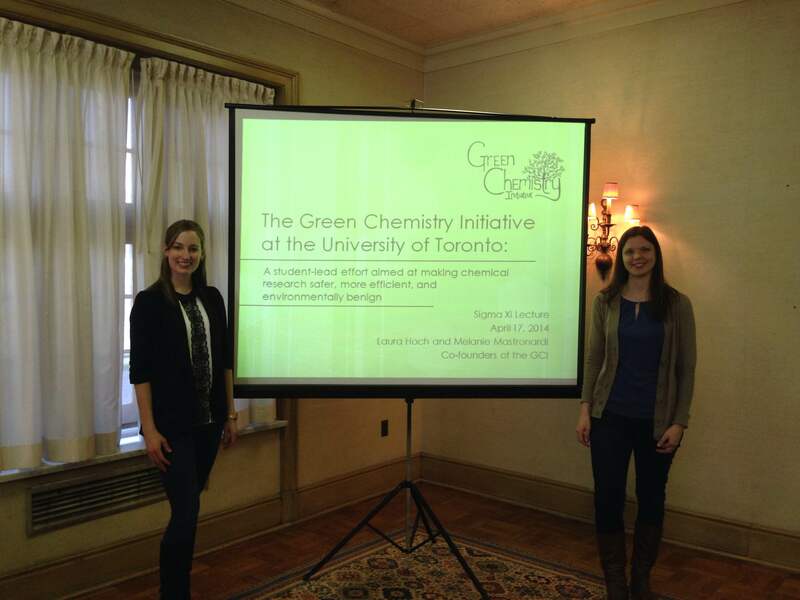 4) We organized a symposium titled “Green Chemistry Initiatives Beyond the Classroom” as part of the 2014 International Conference on Chemical Education held in Toronto in July. The symposium featured 10 presentations that focused on alternative routes to green chemistry education as well as a panel discussion titled “Peer Teaching: Student-Run Sustainability Groups”. Student group panel at our ICCE symposium. 5) We developed a list of “Simple Techniques to Make Everyday Lab Work Greener”, which we shared at the GCI workshop in May and have subsequently posted online. Please check out the poster of our list and feel free to share it or post it in your lab as a reminder. Print out this handy guide for your own lab! 6) We re-launched the “Shut It” campaign – a program originally run in the Chemistry Department at UofT in 2008 to promote reducing energy usage by keeping variable-flow fume hoods closed while not in use. During the 4 months the campaign ran this year, we observed an average compliance of 69%, lowered the building’s energy usage, and taught occupants an easy way to conserve energy in the future. 7) Over the course of 2014, we formed a green chemistry education subcommittee, which has completed a review of the green chemistry content being taught in the chemistry undergraduate curriculum at UofT. 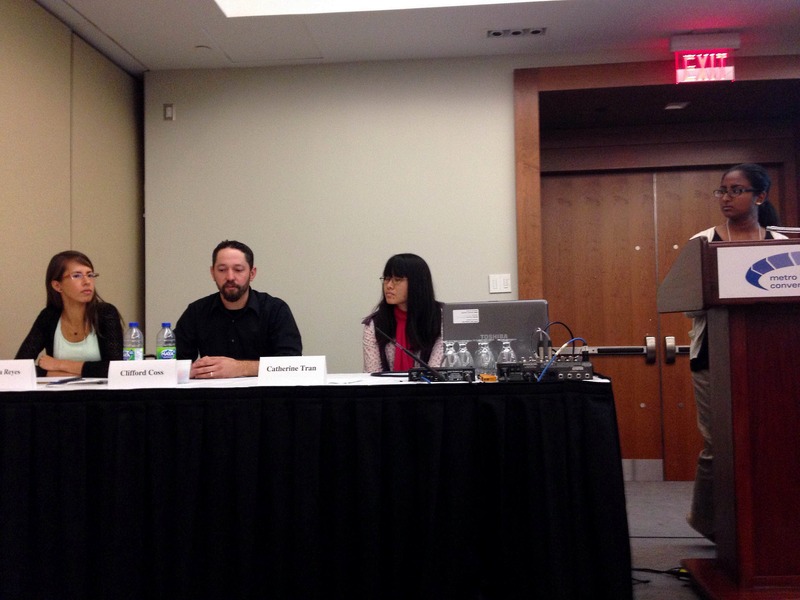 8) Throughout 2014, various members of the GCI represented our group and shared our experiences at conferences and events across North America. Laura Hoch presented at the ACS Green Chemistry & Engineering Conference in Washington D.C.; Laura Reyes presented at McGill University, the CSC Canadian Chemistry Conference and Exhibition in Vancouver, and the International Conference on Chemical Education in Toronto; and Ian Mallov presented at the International Conference on Chemical Education in Toronto. 9) We inspired members of our department to start incorporating some of the principles of green chemistry in their research. For example, it recently came to our attention that the Kluger group has switched entirely from using hexanes to the less toxic alternative heptane. As an added benefit, this has lowered the cost of heptane for our department, encouraging even more people to use it! 10) GCI co-founders Laura Hoch and Melanie Mastronardi were invited to present the Sigma Xi Annual General Meeting Lecture as part of their University of Toronto Chapter Distinguished Lecture Series in April 2014. Laura and Melanie at the Sigma Xi meeting. 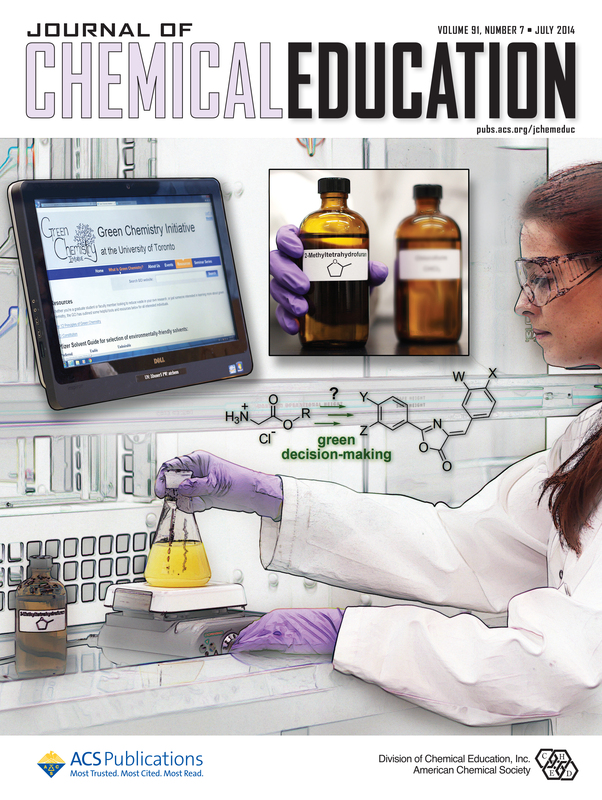 11) We helped design a cover design for the Journal of Chemical Education, for the paper by UofT lecturer Andy Dicks titled “Green Chemistry Decision-Making in an Upper-Level Undergraduate Organic Laboratory”. Learn more about the cover and check out our pictured resources page. We helped create this cover! Our website is featured on the computer screen. 12) In 2014, the GCI joined the Network of Early-career Sustainable Scientists and Engineers (NESSE) as one of their sustainable science groups. Much like the GCI, NESSE aims to empower early-career scientists to tackle today’s environmental and energy challenges, and move towards a sustainable future. NESSE members at the 2014 Green Chemistry & Engineering Conference. This entry was posted in GCI Initiatives, Melanie Mastronardi and tagged green chemistry, student groups. Bookmark the permalink.